Bailey came into my life after the years had turned her black face to white. She was frail, but happy, weak, but with a heart strong enough to steal part of mine. Arthritis had caused her discomfort which caused her to lose muscle. She was blessed with owners who would do anything for the opportunity of more time with Bailey. 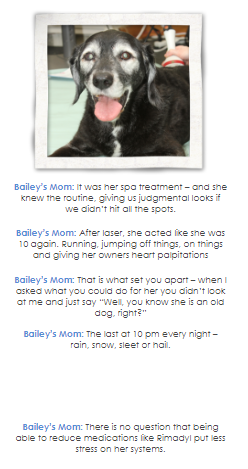 It was May 2013 when Bailey began therapy with our Companion Therapy laser. Radiographs had shown significant arthritic changes in Bailey’s back, hips, and stifles. These areas are where we initially targeted our therapy. Our therapy laser provides comfort and pain relief by reducing inflammation, promoting cellular healing and causing an endorphin release which decreases the perception of pain. This information is for us: the medical staff and care takers, the owners, the humans who love these animals. Bailey didn’t understand how the laser worked; Bailey was generally nervous of veterinary clinics. Bailey was, however, quickly able to differentiate a medical visit to the clinic versus a laser therapy visit to the clinic. If she was pointed towards the door outside to the rehab room she went with a grin. If she was pointed toward an exam room, her head would hang. For the pets, they feel warmth from the laser as it passes over stiff muscles, or aching joints. Some sleep, some lay in their owner’s arms, some nibble treats as they receive treatment. Bailey, like many dark coated dogs, preferred to be sprayed down with water because the dark coats become very warm. Over the months following her initial treatment, Bailey became stronger, more comfortable, happier and less nervous. She began to arrive for her therapy, climb on the mattress and lay down with a smile on her face. Bailey was walking more steadily, she was making more friends and she was happier and more energetic at home. I forgot to mention; Bailey was 15 years old at this time. Everyone that has ever loved a dog knows that one day we will have to face goodbye. Bailey’s owners, all of her friends and myself and the staff here at the clinic were ready to support Bailey with love and various treatments and therapies so the goodbye didn’t come soon. One year passed while Bailey continued laser therapy. She was strong and happy and playful; demanding her walks, asking for visits with her friends (or simply sneaking across the street to say Hi) and stealing my heart. Six months later we all said Goodbye to Bailey. At 16 years old, Bailey had left her mark on everyone she met. At 16 years old she had outlived many wonderful, beautiful pets I have known and loved. 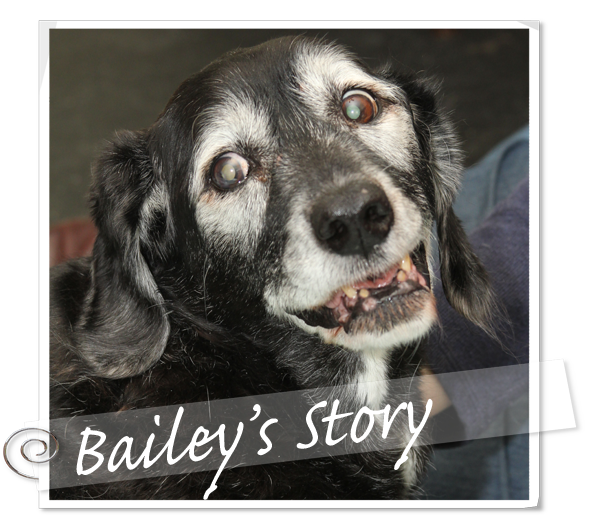 At 16 years old, Bailey had defied the odds. She had, in the last year and a half, regained her strength, comfort and happiness. 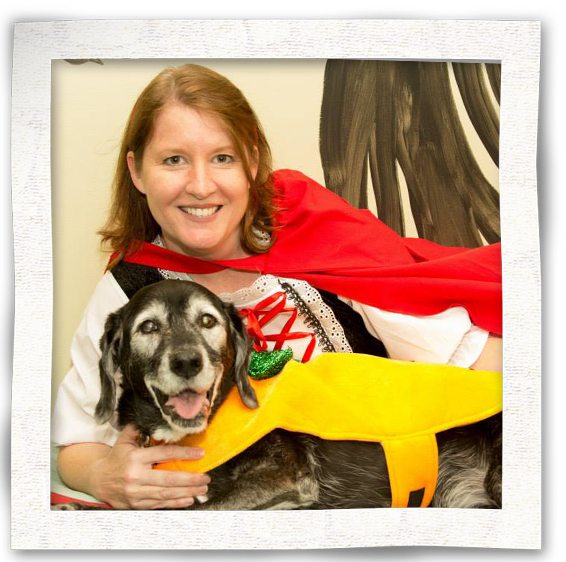 Bailey had, through the combined efforts of our therapy and treatments and her owner’s dedication and love, given all of us a gift; the gift of time. For a year and a half we were able to block goodbye… but goodbye always comes. Together we gave it a good fight.